One of the questions I often get is why don’t consumers move to mail as much as they used to. There are several reasons why, but I think this chart from the PBMI 2010-2011 Prescription Drug Benefit Cost and Plan Design Report does a good job of summarizing one issue – less savings. 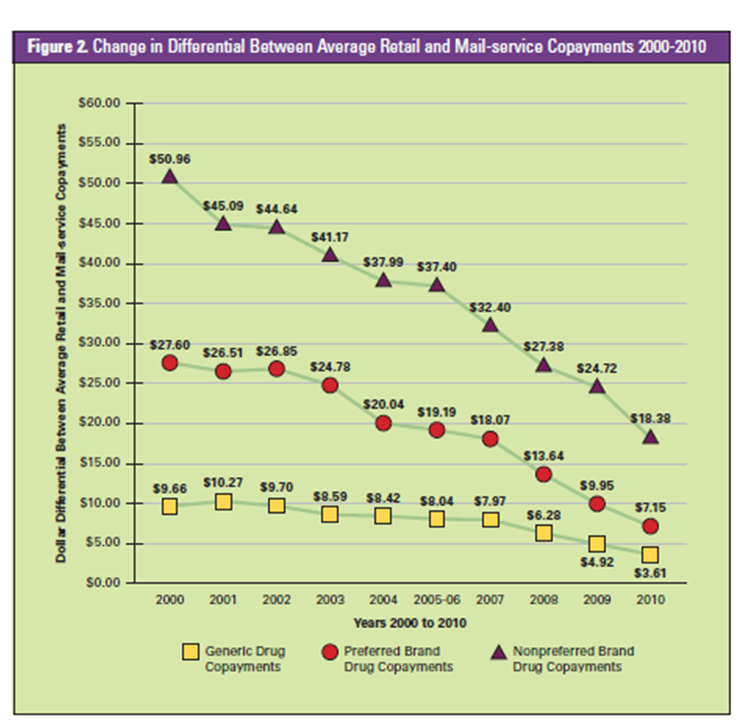 This shows how the savings of moving from retail to mail has gone down over the past 10 years. Adam, I beg you to do a look back cost analysis on any Mail order account vs. a look back analysis on retail distribution. An analysis that uses real cost numbers not manipulative AWP numbers, an analysis that lets the retail distribution channel decide what the charges are to be to the payer not the PBM. Or if you do not have the time, pick any account, your mail order best case scenario, and I will do it for you and ship it back to you for you to check and confirm. Mail order rarely wins in bottom line dollar comparisons. The PBMI data reflect the cost to the plan sponsor (payer), so the figures are an accurate representation of the mail vs. retail cost *for the payer. * Reimbursement for brand drugs is still denominated in AWP, so my comparison is fair. Good observation about consumer motivation, but it’s been a very different story for payers. The PBMI data show that the gap *for the payer* between retail and mail-order pharmacy reimbursement has been growing, not shrinking. In 1999, retail pharmacy reimbursement was 86.9% of AWP (or AWP minus 13.1%) vs. 82.6% (or AWP minus 17.4%) for a mail-order pharmacy. These rates constitute a difference of 430 basis points (17.4 minus 13.1). The gap in reimbursement was 580 basis points in 2010. See Exhibit 28 in The 2010-11 Economic Report on Retail and Specialty Pharmacies (http://www.pembrokeconsulting.com/pharmacy.html).